Animal organs. Nervous system. Diencephalon. Atlas of plant and animal histology. Diencephalon, telencephalon and hypothalamus constitue the prosencephalon or forebrain. 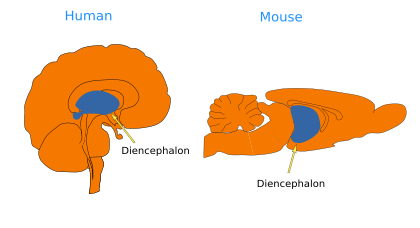 The diencephalon is located between mesencephalon and hypothalamus (see figure). 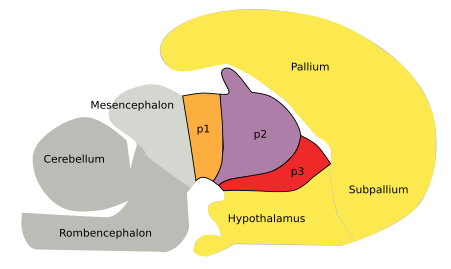 According to the segmentary model, diencephalon is divided in three transversal compartments that from caudal to rostral are known as p1, p2 and p3. The diencephalic alar plate (dorsal regions) are the pretectum (p1), thalamus (p2) and prethalamus (p3). The basal plate (ventral region) of the diencephalon, known as diencephalic tegmentum, is very small. Location of the diencephalon in the brain. The hypothalamus, which has been traditionally considered a part of the diencephalon, is now included in the secondary prosencephalon, and encompass the basal plate and part of the alar plate of the secondary prosencephalon. The rest of the alar plate of the secondary prosencephalon is occupied by the telencephalon. According to this new disposition, the hypothalamus is prechordal, developmentally originated rostral to the notochord, whereas the diencephalon is epichordal, originated from embrionary regions located dorsally to the notochord (see Puellles et al., 2008). The largest part of the diencephalon is the alar plate. The pretectum (p1) processes information coming directly from the retina and it is in charge of the pupilar light reflex. In the thalamus (p2) is modulated most of the sensory information, excluding the olfactory input, and send the result to the cerebral cortex, which in turn sends new information back to the thalamus. The habenula is found in the dorsal part of the thalamus, also known as epithalamus, which makes connections with the rest of the thalamus, but not with the cerebral cortex. Pineal gland or epyphisis is also located in the dorsal thalamus, and is made up of glial cells and pinealocytes, which release melatonin, hormone involved in circadian rhythms. Prethalamus (p3), previously known as ventral thalamus or subthalamus, is connected with the striatal region of the telencephalon and substantia nigra, a dopaminergic center of the mesencephalon.